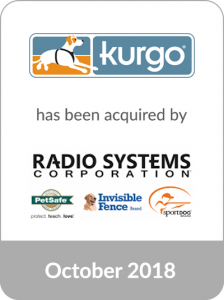 Motivation Design, LLC, doing business as Kurgo®, a designer and marketer of small companion animal lifestyle products, was acquired by Radio Systems Corporation, a global leader in pet containment and lifestyle products through its PetSafe® Brand, Invisible Fence® Brand and SportDOG® Brand. Based in Salisbury, Massachusetts, Kurgo offers a portfolio of innovative, highly functional and easy-to-use pet travel products that allow families and pets to experience outdoor travel and adventure together. Kurgo’s outside-the-home product line is positioned to capture the active lifestyle pet goods market, which is a large category with significant growth potential. Popular Kurgo solutions include products for traveling in the car with your dog such as car seat covers, crash tested harnesses, and booster seats, as well as products to make the outdoor excursion a success such as active harnesses, backpacks for dogs, dog life jackets, leashes and collars. The acquisition of Motivation Designs represents another successful transaction in the pet industry for the Cascadia Consumer & Retail team. Cascadia has now closed sixteen pet industry transactions, including three in 2018. Recent Cascadia clients in the space include Nulo, Fruitables, Manna Pro Products, and PetFlow.